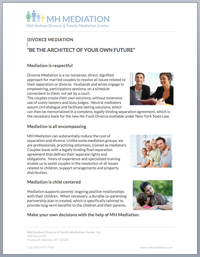 Since 1981 MH Mediation has offered divorce mediation services. In addition, MH Mediation offers prenuptual and postnuptual agreement mediation, estate and family dispute mediation, as well as family owned business dispute mediation. Well over 90% of all couples and groups that have worked with us have successfully resolved their disputes. Our lawyer-mediators offer a calming and intelligent interaction with both sides in a dispute. In our process each side has a full opportunity to express themselves and to be sure they have a full understanding of the other party’s point of view. The mediators at MH Mediation are trained, experienced, and knowledgeable about all aspects of dispute mediation and solution. They are active in the mediation field and have helped lead the way in making mediation the widely accepted technique it is today. With help from a divorce mediator, parties not only reach agreement on all issues, but also learn to negotiate productively. For people with children, finding a way to work out issues in the future can be critically important for the long term happiness of all parties and their children. Generally mediation is less emotionally aggravating, less expensive and less time consuming than resorting to costly court battles.